Of all the “one hundred languages of children,” drawing is among both the most accessible and, for some children, the most powerful. I have known many verbally gifted five-year-olds, and none of them could do justice to her biggest ideas through words. 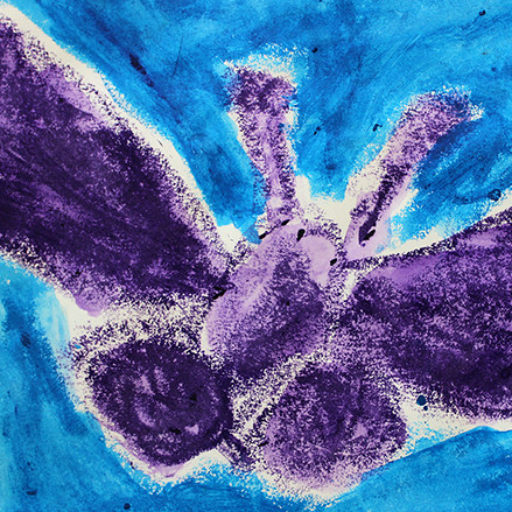 Drawing, however, offers a way for children to access their most profound ideas and make them known. For this to happen, though, children have to learn the medium and know the power they have through drawing. When they first enter school at 5, many of the children I have known have already developed coping mechanisms for dealing with the frustration that can come with having intent to represent but not the ability or confidence to do so. They may have had the desire to draw what they know or see when they were 3 or 4, but may not have had the tools, techniques, or control they needed to realize their intent. Without support, many children develop work-arounds to allow them to cope with the emotional discomfort of frustration. They may only draw what they know how to draw; or make multiple attempts to draw what they have in mind and then, dissatisfied, ball up, throw away, and give up; they may fuss or cry in frustration or ask an adult to draw it for them; they may just give up and call the drawing what it looks like; or they may have stopped drawing altogether. None of these strategies helps the child learn that she can make her ideas visible or helps her learn how. This is where the “study protocol” comes into play. We want to send the message to children that they can draw anything in their minds and that we will help them until they are satisfied that they have succeeded. 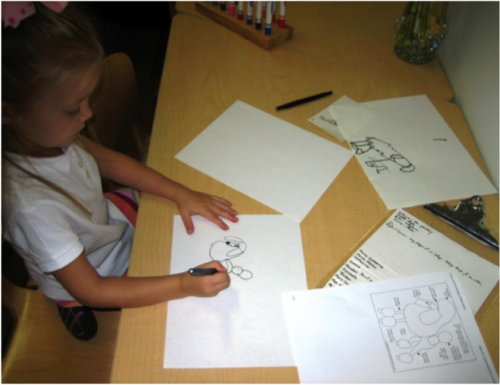 To this end, we established a system we called the “Study Protocol.” It works like this: We invite the child who has declared intent to represent to take a stab at drawing what she wants to draw. If she is not satisfied, she puts a number 1 on the attempt and puts it aside, rather than throwing it away. We tell the children every try is too important to their learning how to draw to throw it away. The child tries again, using whatever support she needs. It doesn’t take long before children are asking for the help they need, such as pictures to use as referents or the help of a teacher or another, more experienced, child. But in the beginning, we adults have to guess what support is needed and offer it. If, after a second attempt, the child is still not satisfied with the drawing, she writes a “2” on it and tries again, and so on, until she is satisfied. We do use the term, asking children if they are satisfied when they appear to be finished. M wanted to draw a poodle. After a few tries, she sought out a teacher, because she was dissatisfied with her attempts. The teacher knew that there were multiple possibilities for where the process fell apart for M. Did she not have a complete enough mental image of “poodle?” Did she need emotional support to supplement her confidence or persistence? Was there an issue with motor control? In order to understand M’s process a bit better, the teacher sat down with M and asked, “What does a poodle have?” If M had had a deep enough understanding of “poodle” but needed to “borrow” control or confidence, she might have been able to proceed with the teacher’s presence only. If she knew what a poodle has but couldn’t seem to make the shapes she had in mind, the teacher could have helped her practice the shapes she wanted to draw on another piece of paper, supporting M’s efforts both cognitively and emotionally. In this case, conversation with M revealed that she needed a more complete mental image of poodle. So she and her teacher did an image search online. M chose a drawing of a poodle that she thought would help her best. They printed it out (these days we’d be doing the search on an iPad…no printout required), and with the referent in front of her, M tried drawing the poodle again. The teacher was able to withdraw at that point, and M drew a poodle that satisfied her. M begins her second attempt at drawing a poodle. Her first, labeled with a “1” is top, right. The referent M is using is bottom right. Eventually children use the study protocol on their own…making multiple attempts, asking for referents when necessary, and using tools and techniques learned along the way. We keep all attempts as well as the final one, honoring them as the “drawing teachers.” It is our hope that the children’s intent to represent their thoughts and imagination will not be disrupted by frustration, and that’s usually the way it works. 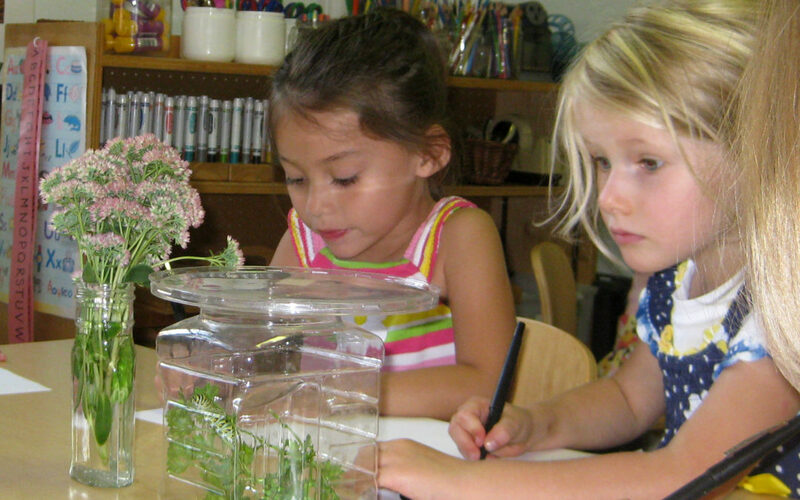 Once the children are comfortable with the protocol and see how it supports their desire to represent, they often choose to “study” the birds that feed outside the classroom, the shells a friend brought to school, or anything else that they wish to observe. For this we offer clipboards and “thinking pens” (black felt tips).